Age Concern Meals Clubs, Services and Activities Listings. Welcome! 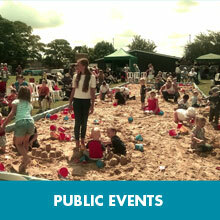 On this page you will find details of many things-to-do here in Earl Shilton. Whether you are a resident or just visiting you should find plenty to get involved with, from volunteer groups to craft workshops and sports clubs. www.esbaptistchurch.org.uk Earl Shilton Baptist Church. www.earlshiltonmethodistchurch.org.uk/events Earl Shilton Methodist Church. www.ageukleics.org.uk Age(UK) Leicester, Shire & Rutland. TUESDAY 2.30-3.30pm All welcome pop along and see what we do. WEDNESDAY 9.30-11.30am Painting/needlecraft . Please bring your own materials. WEDNESDAY 2.00-3.15pm We have speakers,singers,trips come and make new friends. THURSDAY 9.30 AM Meet at centre Walking for health.